Will It Be a Grand Old Party? State Republicans to Decide if Future Is With Trump. (Update, 12:30 p.m. PT, 1/03/2017): Congressman Tom McClintock’s office says he too voted against ethics changes on Monday. (Update 12 p.m. PT 1/03/2017): Congressman David Valadao’s office says he too voted against ethics changes on Monday. Update (11 a.m. PT 1/03/2017): on Tuesday, the Republican delegation reversed themselves, per many media reports, including Fox News. Facing backlash for an impending change to House of Representative ethics rules, the Republican delegation reversed course on Tuesday, deciding not to implement any changes. On Monday, the delegation held a closed-door vote to eliminate an independent ethics committee. 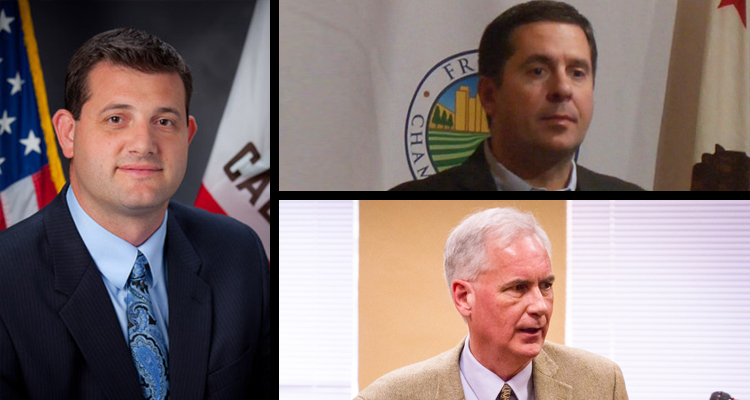 Despite the secret nature of the vote, spokespersons for Congressman Devin Nunes (R-Fresno/Visalia), Tom McClintock (R-Oakhurst/Shaver Lake) and David Valadao (R-Hanford) say they voted against the change. House Republicans were somewhat split over the late amendment, which was proposed by Rep. Robert W. Goodlatte (R-Va.), chairman of the Judiciary Committee. The vote was 119 to 74. The changes, according to the LA Times, include taking the Office of Congressional Ethics under the auspices of the House Committee on Ethics. The new panel would not be allowed to investigate anonymous tips. On Tuesday, the idea for changes in ethics rules was scrapped. GV Wire is still awaiting word from representatives of McCarthy on how he voted. Note: an earlier edition of this story indicated McCarthy represented Tulare. While he does represent parts of Tulare County, he does not represent the city of Tulare. The story has been updated to reflect a more specific town in the county in his district.